While history doesn’t repeat, it certainly does rhyme. All real estate booms follow a very similar pattern. Higher prices tend to pull demand forward, at the same time drawing in a larger class of investors. This creates two things, well actually three things. Sales increase, available inventory for sale declines, which results in rising prices. As we can see, just a few years ago there was a healthy number of condos for sale. 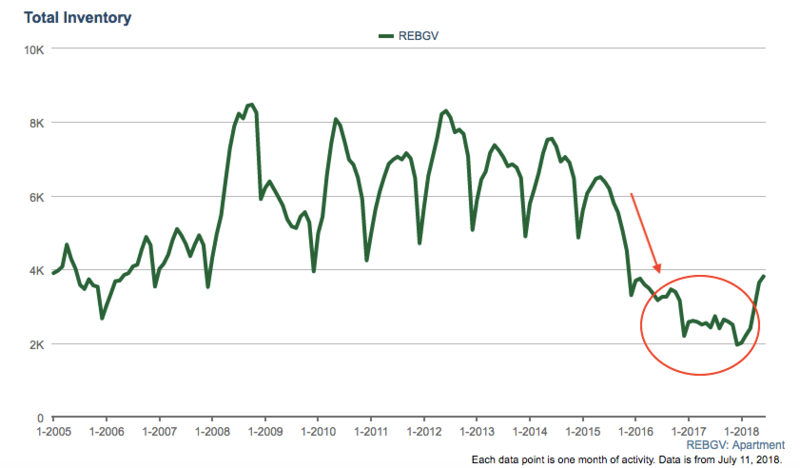 However, in a very short time frame condo inventory plunged to record lows over the past few years. Rising prices and a perceived scarcity created a fear of missing out and buyers snatched up remaining units almost regardless of price or condition. This allowed condo prices to inflate rapidly, growing 30-40% year over year in many areas. These market conditions create an excellent opportunity for developers to build and maximize profits. Demand appears insatiable and it feels we will never have a surplus of housing again. As such, developers rush to meet the demand. To no surprise, Condo units under construction in greater Vancouver has reached an all-time. As of May 2018, there were over 35,000 apartments under construction, more than three standard deviations from the long term mean. Apartments under construction in Greater Vancouver. However, the good times don’t last forever. While Developers are making profits hand over fist, the extrapolation of current market conditions leads to an overshoot of expectations, and ultimately an oversupply of new housing. This generally comes at a time when demand begins to falter. As demand wanes, an abundance of new housing supply sits in the pipeline waiting to hit the open market. New housing construction is left to compete with resale condo units, essentially cannibalizing each other. 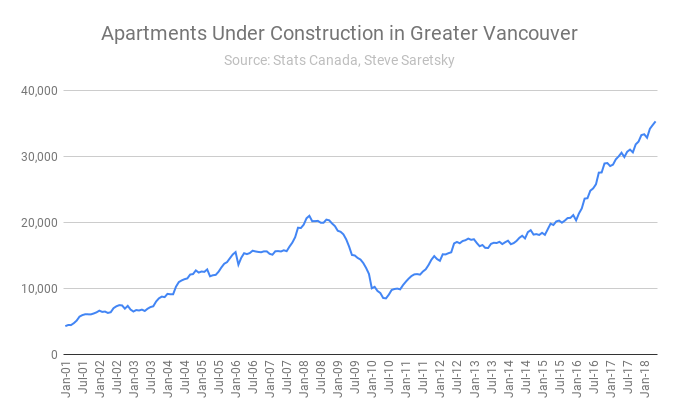 While we have a record number of new Condo units under construction in greater Vancouver we also have new housing starts ticking in at record highs. A housing start generally means the project is a couple years away from completion. 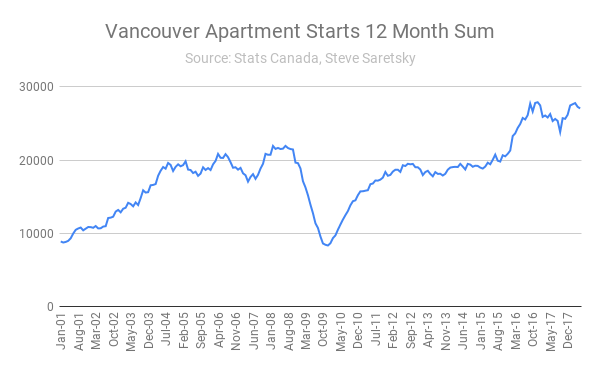 Vancouver apartment starts, 12 month sum. The pre sale condo market which functions the same as a futures market, is highly speculative. The majority of buyers are typically not end users and will either re sell the unit upon completion or rent it out, again, adding to housing inventory. We are currently experiencing signals that the Greater Vancouver condo market is in the late stages of its real estate cycle. As of June 2018, sales have decreased by 35%, inventory has increased by 57%, and many developers have begun offering bonuses and decorating allowances on available pre sale units. It won’t be long until developers begin pulling back on housing starts.